Do kids know how to kare? 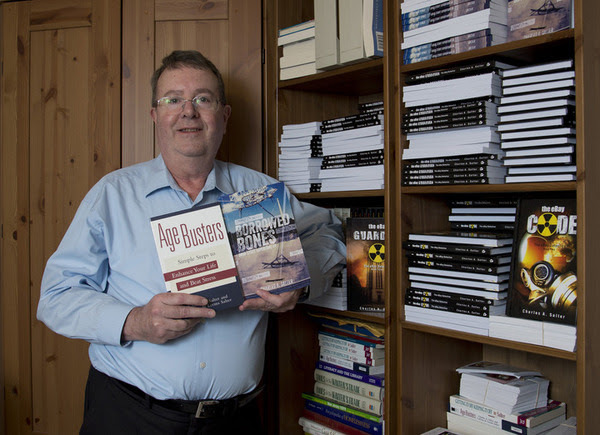 Today I'm delighted to welcome Charles Salter to my blog. He's the author of the Kare Kids Adventures series, and the first installment, The Secret of Bald Rock Island, has just been released. These books are aimed at fans of adventure fiction such as The Magic Treehouse series, so read on, find out more, and enjoy an interview with the author. Years ago, Kelcie's father disappeared at sea. Now that she's ten, Kelcie wants some answers. With the help of her father's lifelong best friend, Mr. Bartleby, Kelcie crosses the island in search of clues to what may have happened the night her father disappeared which seem strangely linked with the legend of The Bald Rock Monster. From learning how lobstering works to understanding Mr. Bartleby's past, Kelcie pieces together the mystery and thinks she knows where she can find the ultimate answers: the forbidden area of the island, Bald Rock. ABOUT THE AUTHOR... Well, pour a coffee, pull up a chair, and let's chat. Thank you so much for visiting my blog, Charles. Can you tell us what inspired you to create this series? For the past few years I have become increasingly concerned about the trend in our society to infantilize young people and make them dependent on the ‘nanny state’ rather than independent and mature adults who can help lead our society into the future. I hope my series will help young people realize they do possess heroic qualities and can make a difference by standing for what they believe and seeking to help others. That sounds a really good aim, and it's something kids do need to learn. What is your writing process like? Did you plot the entire story of The Secret of Bald Rock Island before you began writing or did you come up with it as you wrote? I know some people like to outline their entire novel before starting to write, but I like to begin by dreaming up imaginative new characters and putting them into an exciting new situation or crisis. They soon begin to take on a life of their own and seem almost real to me, and they’ll tell me how they want to resolve the problem. Early on they will tell me what the ending is, but it is always an exciting adventure for us to discover together how they will get there. That's how I like to write too. The characters have to be real enough to argue with me before I can make them real to readers. And, thinking of characters, who inspired the character of Kelcie? Kelcie is a composite of my two daughters. Out of the entire series so far, volume #1 is the only one set in the past—about one generation ago. At that time, my now-adult daughters were children and we often went to Maine (the location for this novel). We saw and experienced the kinds of places described in the book! How cool! And how cool that your daughters don't mind being part of your writing (I suspect my sons would never talk to me again if I suggested I'd used them in a book!). Presumably Kelcie shows some traits you would like young children to emulate. Can you describe them? Kelcie may be only ten years old, but she knows how to think for herself and decide how she can best help others. She is a true “Kare Kid” who not only has a caring attitude towards family, friends, animals, and the environment, but she translates that concern into real action to accomplish her goals. In the surprise ending of the book—when she finally confronts the mysterious island creature face to face—her beliefs and principles about life and nature lead her to suggest an amazing solution to the adults on the scene. That sounds intriguing. I'll have to read the book to find out what you mean, and I must admit, I'm looking forward to reading it. What do you hope both your young readers and the parents of those readers take away from the books? Family and friends in this series clearly cherish and care for each other. I would hope these stories would encourage both parents and young readers to do the same. I would hope that young readers would learn the importance of going beyond having a good attitude about others and translating that into real action to help when needed. And I hope parents will learn the wisdom of sometimes stepping back and letting kids work through their own solutions to life’s problems and issues…yet also be available when those kids ask for help. Independence is a huge theme in Kare Kids Adventures. To what extent did you or did you not experience independence as a child? My parents were absolute models for fostering independence in me and my siblings…often to a degree which would be considered illegal these days! I had my first paying job when I was about age 5—babysitting the infant of neighbors who lived in the same apartment building where we did. My mother was in a nearby apartment in case a real problem developed, but I sat with this wonderful kid and read books and took care of him otherwise. Later that year I took sole care of my baby brother (about age three) when both my parents worked. I dressed and fed and entertained him when I was only 6 and my mother was at work for three hours each morning. A few years later, on non-school days I and my brother or friends would be on our own all day, playing in the woods or riding bikes or playing sports. No cell phones in those days, and we were on our own until meal times. By age 19, I went to England for my college junior-year-abroad and toured all of western Europe with just my friends. During that year I experienced the amazing adventure in Norway which lies at the heart of book #4—THE TRAVEL TWINS AND THE LOST SECRET OF THE VIKINGS. Oh wow! So Book 4 is already on its way! How did your experience as a parent and grandparent influence The Secret of Bald Rock Island? I have always tried to encourage my own children and grandchildren to become independent and make their own decisions about which sports, activities, and careers to choose. I taught them to stand up for what they believe. And this is exactly what Kelcie’s mother and dear family friend, Mr. Bartleby, do for her in this book. As Kelcie comes to grips with the loss of her father years earlier, both adults encourage and help her to work through that process in a mature way. I hear you have a background in psychology too. Did this help you when writing this series? If so, in what way? As everyone knows, much of psychology focuses on mental illness and other pathological conditions. But part of the field focuses instead on fostering close and healthy relationships, particularly among parents and children. One area of thought and research in psychology which has always interested me is that about not simply telling kids what to do, but rather encouraging them to think through problems and issues so they can come up with their own insights and solutions. 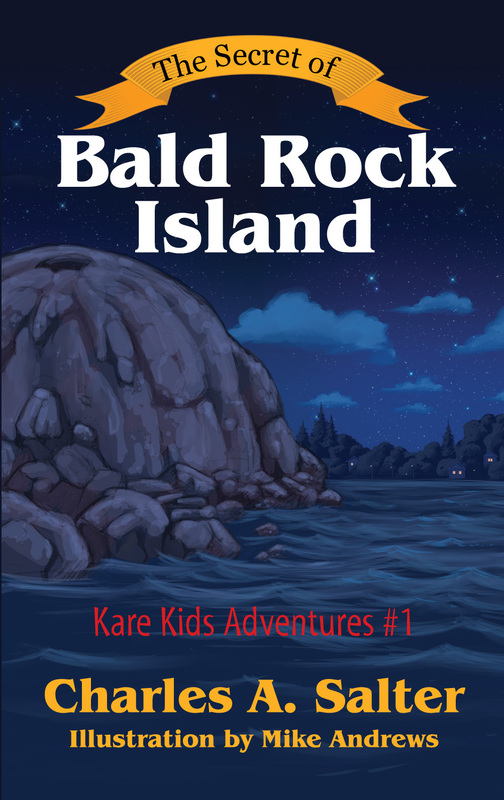 And that is exactly how the adults in this book handle Kelcie’s quest to solve the mysteries of Bald Rock Island. So, thinking of how you said the world, and treatment of children, is changing, how do you think technology and the age of the helicopter parent have influenced independence in children today? Everything seems different these days compared to when my generation was growing up. Technology certainly has its advantages, but it can also isolate children from healthy and beneficial social relationships. If you’ve ever seen a bunch of kids sitting together, but with each one lost and alone in his/her own electronic device and virtual world, you can sense the downside of technology. Doing things by oneself is not the same as independence. True independence does not imply social isolation but rather the ability to think for oneself and play a leadership role in a social situation. Parents who want the best for their children will not become over-protective and smother their development by always being present and doing everything for them. Children need to mature by becoming self-reliant and capable of doing things on their own, but they can’t accomplish that if a helicopter parent is always hovering around and making all the decisions. And thinking about that fact that you already know where Number 4 is set, when will the next installment of the Kare Kids Adventures Series come out? In book #2, CHARLOTTE AND THE MYSTERIOUS VANISHING PLACE, Kelcie is now grown up and her 9-year-old daughter is the star. Charlotte discovers a serious environmental danger in the woods and does everything she can to alert authorities and rescue two trapped puppies. This book is due out on July 1 of this year. In book #3, HOW THREE BROTHERS SAVED THE NAVY, Charlotte’s three cousins uncover a terrorist plot to destroy their navy father’s ship. They show great courage and ingenuity in ferreting out the details and then thwarting the plot. That book is due out in early August. Charlotte’s twin brother and sister should be coming along some time in early fall in book #4, in THE TRAVEL TWINS AND THE LOST SECRET OF THE VIKINGS. This book’s plot unfolds on a scary (but real) train winding its way high in the beautiful mountains of Norway. Felons with mysterious motives have stolen the famed Leif Erikson Sunstone from their uncle’s Viking museum in Oslo, and the twins decide to get it back. In all of these books, the Kare Kids can’t rely on magic or super powers to solve their problems. They are realistic kids who live in the real world…BUT they know how to act independently and to translate caring from a mere attitude into genuine action to solve the problems they encounter. It sounds a really cool series. Thank you for dropping by to tell us about it, and I hope you find lots of eager readers, ready to become genuine independent heroes in the real world. Sheila, thank you so much for hosting me on your blog this week! I'm delighted at how you organized the presentation and also by your wonderful comments. I hope you and your readers enjoy a safe and happy summer...and will keep an eye out for the next two volumes of THE KARE KIDS ADVENTURES due out in July and August! You're very welcome. I'm looking forward to reading number one, and I shall look out for more. Does fiction lie, or tell truth through lies? Crossed any good genres recently? What Type of Children's Story Do You Prefer?